Australia is a country well known for it’s wine, especially of the Red variety. Adelaide is the gateway to some of the best known wine regions of Australia, including the Barossa and Clare Valleys and the Coonwarra region. 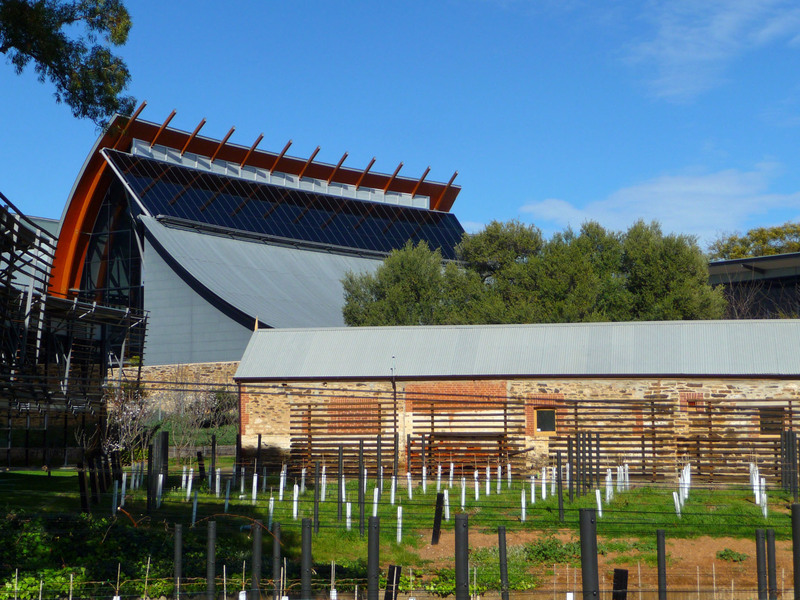 Because of this, there is a huge pavilion in Adelaide dedicated to the love of wine, called the National Wine Centre of Australia. 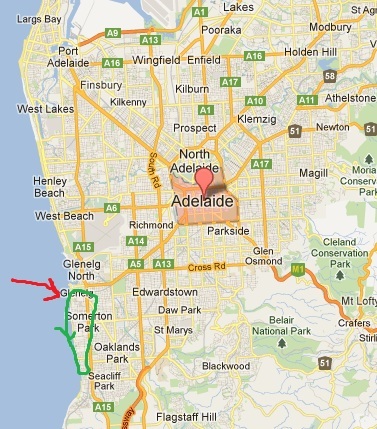 Adelaide is close to a decent sized body of ocean (Gulf St. Vincent), and makes excellent use of that fact with many coast-side suburbs. Probably the most well known and accessible is the suburb of Glenelg, an easy tram ride away from the downtown. Given that it is still winter here Glenelg was pretty empty, despite the wonderful sunny day. I had the area pretty much to myself to do some exploring. The downtown design of Adelaide, in my mind, is downright fantastic. The Central Business District (CBD) is laid out in a typical grid-pattern design, but with a notable difference. Surrounding the entire downtown area are significant stretches of parkland. 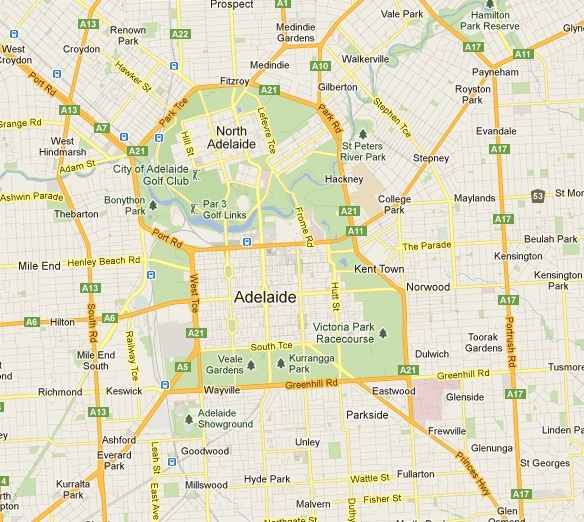 This extends to the ‘Northern’ Adelaide portion of the downtown as well. So no matter where you are in the downtown you are never more than a 10-15 minute walk from serene parkland. It’s brilliant. It was on my first full day in Adelaide that I set out to explore some of this greenery and see what I could find. This was the day AFTER I arrived at 6am by that evil bus, since that day was spent in a hazy stupor trying to maintain any form of coherence and just staying upright. The idea was a simple one. 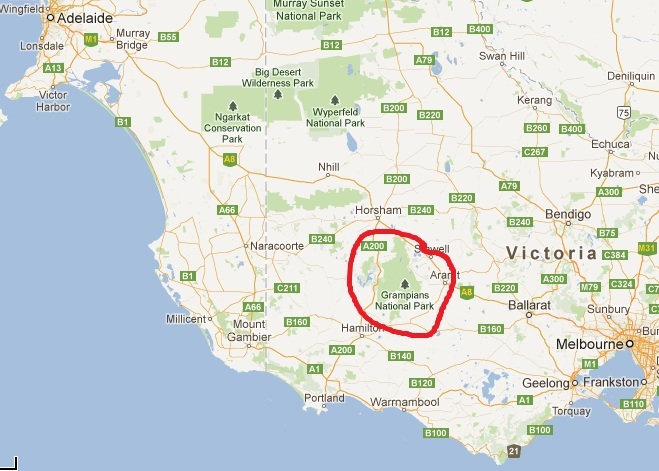 5 of us from the tour were dropped in Ballarat at around 5pm and given our bus tickets to Adelaide. The bus didn’t leave until 10pm, so we made our way to a nearby McDonalds, where we spent the next 4 hours or so waiting, eating, and using their internet. It didn’t appear that Ballarat had much else to do on a Sunday evening, but given the time, that wasn’t overly surprising. The rain and exhaustion from our 3 days of travel kept us pretty sedetary anyways. While still enjoying our lunches, the clouds parted long enough for me to scamper back up to the top of the lookout and get a few nicer views of the surrounding area. A proper panoramic of the view from The Pinnacle. It was a pretty great spot. After finishing up the Great Ocean Road our tour headed inland, towards The Grampians National Park. 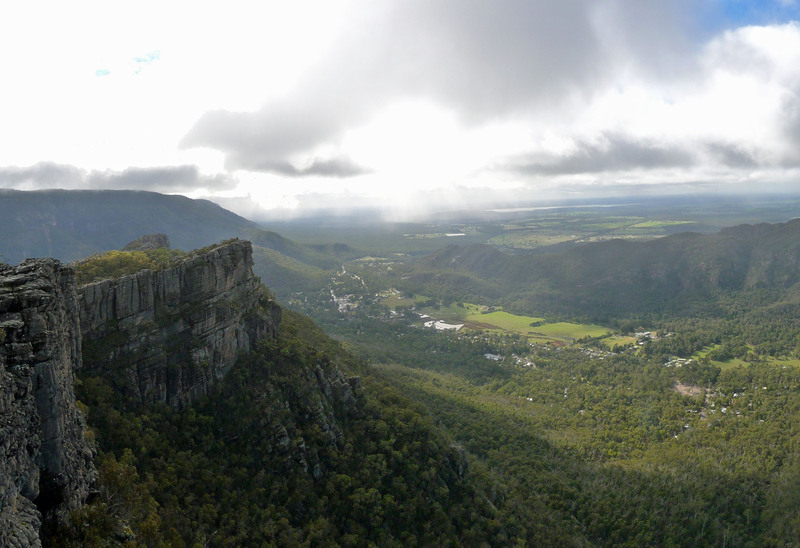 Admittedly, I didn’t know much about the Grampians when I signed up, other than it was a National Park and we got to do some enjoyable hiking. That was enough for me! At the far end of the Great Ocean Road, the land starts to drop away suddenly into the ocean. For the majority of the drive, we are along hillsides that slope downwards into the sea. 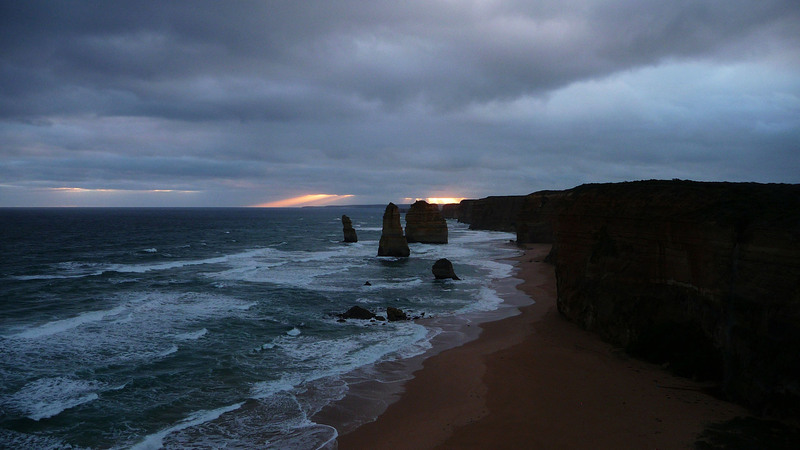 But once you get to the Twelve Apostles, the hills become sudden cliffs. Melbourne has two major tours within easy driving distance. The first is the Phillip Island Penguin Parade. Hundreds of little blue penguins call Philip Island home and arrive in droves once the sun sets. Having already seen numerous little blues while I was over in New Zealand, I instead opted for the other option, which also worked to my advantage of taking me to my next major destination (Adelaide). 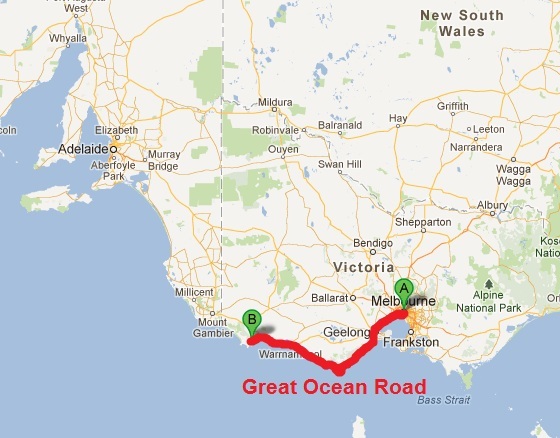 I was going to explore the Great Ocean Road. I was with Bunyip Tours once again, the same company that took me to Wilsons Prom. So I knew I was in good hands.